^ a b "Viceroyalty of New Spain." Encyclopadia Britannica. 2008. Encyclopadia Britannica Online. 2012年4月24日. Tovell, Freeman M. (2008). 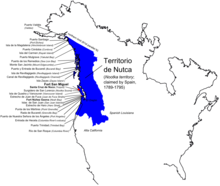 At the Far Reaches of Empire: the Life of Juan Francisco De La Bodega Y Quadra. University of British Columbia Press. ISBN 978-0-7748-1367-9. https://books.google.com/books?id=E8_LXicsIlEC. Altman, Ida; Cline, Sarah; Pescador, Juan Javier (2003). The Early History of Greater Mexico. Prentice Hall. ISBN 9780130915436.